Find device-specific support and online tools for your Motorola moto z2 force edition. Here's how to turn pre-installed apps on your moto z2 force on or off. Here's how to turn your app permissions on/off for your moto z2 force edition. Here's how to remove or delete apps if your z2 force edition is unresponsive, freezes or an app won't open. Here's how to view, open or close recently used apps on your moto z2 force edition. See how to use Google Now to automatically give you updates and information you want on your Moto Z2 Force. Discover how to use your voice in Google Now to write an email, create a calendar event, set an alarm and more on your Moto Z2 Force. Learn how to search for and download an app or widget in Google Play™ Store on your Moto Z2 Force. 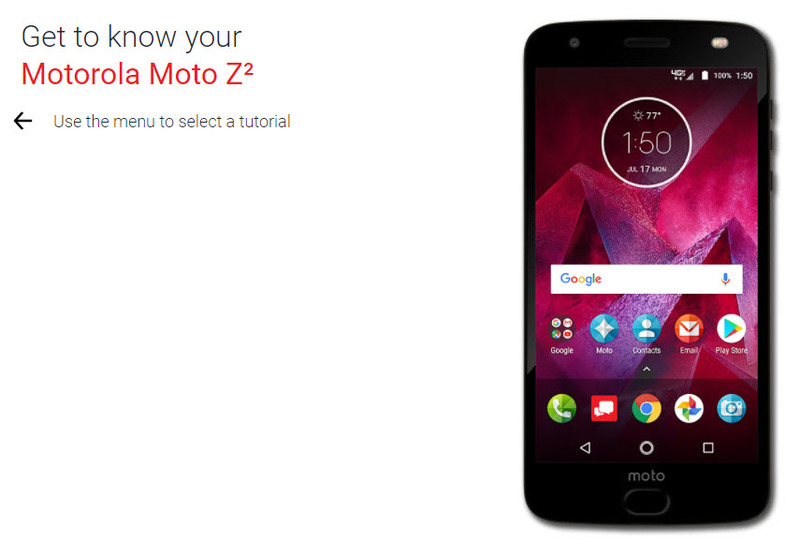 A visual walkthrough for uninstalling an app or widget from your Moto Z2 Force. Learn how to find places around you in a chosen category using Google Maps on your Moto Z2 Force. A visual guide on how to navigate to a location using Google Maps on your Moto Z2 Force. A visual guide for how to add layers to Google Maps to view current traffic on your Moto Z2 Force. Learn how to back up call history and messages on your Moto Z2 Force with Verizon Cloud. Discover how to back up your contacts with Verizon Cloud on your Moto Z2 Force. Learn how to back up media on your Moto Z2 Force with Verizon Cloud. Learn how to download files onto your Moto Z2 Force with Verizon Cloud. Learn how to restore content to your Moto Z2 Force with Verizon Cloud. An interactive guide on how to set up Verizon Cloud to back up content on your Moto Z2 Force. Find out how to get more storage for your Verizon Cloud account using your Moto Z2 Force. Discover how to send a video message using your Moto Z2 Force. See how to forward a text message using your Moto Z2 Force. Learn how to reply to a text message on your Moto Z2 Force. Find out how to send a text message using your Moto Z2 Force. Find out how to send a text message to a group of your contacts from your Moto Z2 Force. An interactive how-to guide for sending a text message with your voice on your Moto Z2 Force. Discover how get directions to a location using VZ Navigator® on your Moto Z2 Force. Learn how to search for a local location using VZ Navigator® on your Moto Z2 Force. An interactive guide for how to add layers to VZ Navigator® to view current traffic on your Moto Z2 Force.